CONCEPTS ARE GOOD – IF THEY MAKE THE PRACTICE BETTER. Analysis is always the first step when it comes to putting your projects into practice. We examine your situation closely before guiding you actively and responsibly through the entire project life cycle. Together with your managers from different levels of the organisation and with the help of method-based processes, we develop the exact steps you need to take to make the best use of your existing and potential resources. 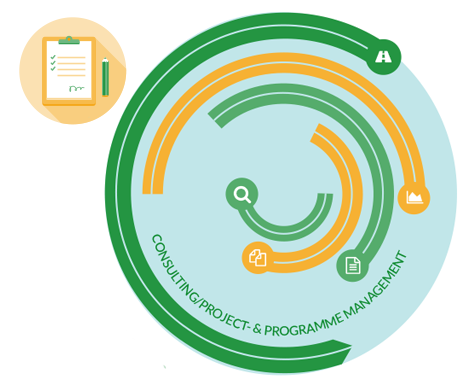 We offer services – ranging from consulting to assuming responsibility for implementation, as well as engineering services – in a modular design that allows you to choose the scope you really need. If you are looking for premium concepts to be implemented in multiple businesses and locations, we are the right partner for you. Thanks to our wide-ranging experience, we ensure that you get the most out of synergistic savings and cross-site efficiency analyses. There is a wide array of process-supported systems around to choose from. We help you to find the one that suits your company and your specific requirements best by looking at this question from various angles and multiple dimensions. In close cooperation with you, our consultants from prime4services will create a tailor-made strategy for your company. The concept derived from this defines all the steps that need to be taken – always aligned to the expected return on investment. Without a good design and professional project management methods, any MES or T&T project is doomed to fail. You will find yourself reworking it extensively, resulting in unplanned additional time and costs, with a direct impact on your return on investment. What is the use of a solution that is perfectly harmonised initially if it mutates into a host of isolated applications within just a few months, with the corresponding negative impact on costs? Isolated initiatives rarely lead to strategic target achievement and manufacturing excellence. Successful approaches are always based on an extensive analysis of your company’s established processes and experience. Really good, helpful consulting services are based primarily on extensive experience. We offer you practical advice down to the last detail thanks to our comprehensive expertise gained over many years in a wide range of projects.